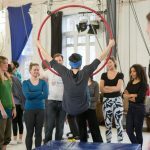 We have a huge team of circus teachers, too many to name individually. You’ll meet them joining you in the dance classes, and then they’ll help to make the magic happen…. Take it from past attendees, it’s like no other festival you’ve ever been to. We’ve been wanting to have Sharon Davis join us for a few years, and we’re delighted to welcome her this year. You probably already know why, as she’s already been a world-level teacher, performer, and competitor for many years, but in case you don’t…. Sharon is internationally known for her distinctive and feminine style in Lindy Hop, 1920s Charleston, Blues and Burlesque. 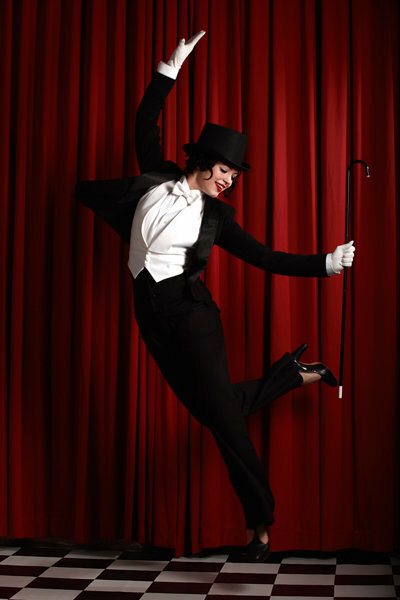 Australian born but now based in London, Sharon has performed around the world and holds numerous 1st place competition titles, including at the International Lindy Hop Championships, Ultimate Lindy Hop Showdown, National Jitterbug Championships, Canadian Swing Championships and the Burlesque Hall of Fame. She is known for her dedication to the history of vernacular jazz dances and the music they evolved to. A sought after instructor, her classes focus on pairing dynamic connection and flow, with body awareness and quality of movement, as a pathway to individual style, creativity and musicality. With her bright and bubbly personality, Sharon’s teaching style is energetic, inspiring and fun. She is also the director of the annual European Swing Dance Championships. Visit www.sharonmdavis.com to find out more about her. Benjamin originally hails from Melbourne, Australia, where he found swing dancing in 2006. 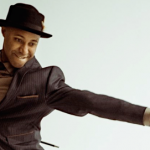 He now lives in London; teaching, performing and traveling the world chasing Lindy Hop. Benjamin is a full time Lindy Hopper and currently runs two weekly swing venues in London, two performance troupes, and has taught all around Europe for the last 8 years. 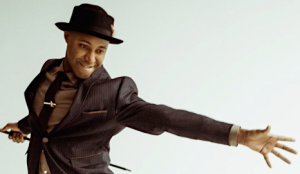 Proud to have come from a background without professional dance training, he has placed in over 30 different competitions around the world, is a 2-time UK Lindy Hop Champion and also won the Advanced Strictly Lindy at ILHC in 2013. Benjamin’s ability to break down moves and ideas into surprisingly manageable pieces, and attention to personal detail of his students has earned him a reputation as one of the UK’s most prominent instructors. Ben loves to teach people all the things that he loves about swing, and his number one goal is always to show dancers the ways to exceed their own expectations without straying from having fun! When he’s not on the dance floor he is a hi-fi geek from way back, a fan of all things unicorn related, and has an unhealthy obsession with hot cross buns. 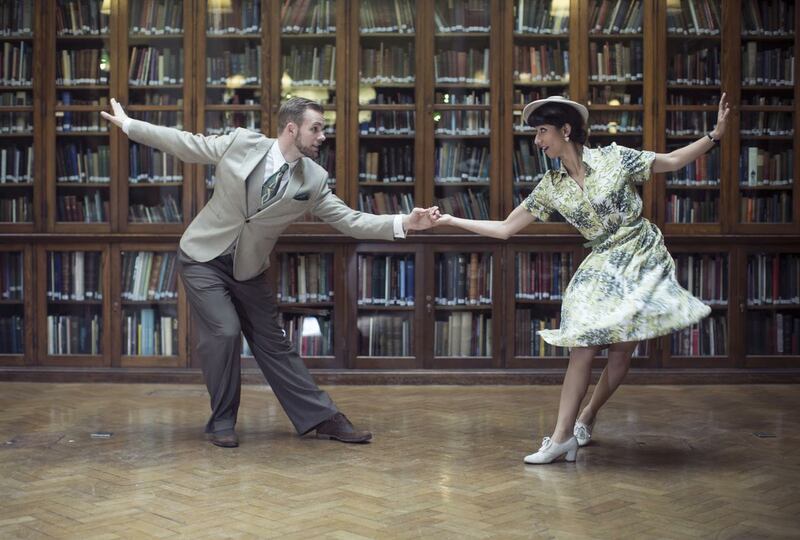 Cat and Cam are a team who love sharing the history, creativity and fun of lindy hop with students all over the world. Get ready to laugh your pants off whilst swingin’ the frig out! With 25 years combined teaching experience between them and a similarly ridiculous sense of humour, Cat and Cam are dedicated to helping their students improve and to working to a high standard, whilst not taking themselves too seriously. After teaching for the first time together in 2014, they have not looked back! They love social dancing. They love throwing the hell down Whitey’s Lindy Hoppers style at 300bpm. They love teaching, helping people discover new talents and achieve their perceived impossibles. Most of all, they love making bad jokes. Also Jungle Speed (the greatest game ever). They love that too. Cat and Cam recently won the Fast and Furious division at London Swing Festival, took first place in the Strictly Lindy at Chase Festival in Heidelberg, Germany, and made the finals in the Classic Showcase at the International Lindy Hop Championships in Washington, DC. Want to be nurtured? Rob & Tina are teaching our beginners track, and in just three days they will turn you in to dance floor veterans. Fun, inspiring, encouraging, we’re glad to have them back. teaches regularly for Swing Dance Leeds and Lindy Fridays and helps organize a variety of other events for the Leeds scene. Tina dances for the sheer joy of connecting with the music and a partner and just wants to get everyone on the social dance floor as much as possible! Rob was dragged along to a free lindy hop taster at Leeds Uni back in 2005. Soon after he began teaching regularly and three years ago he turned it into a full-time job. 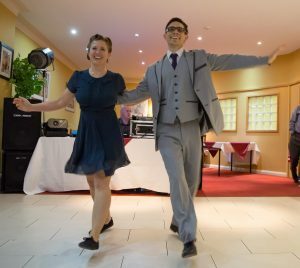 Rob runs Swing Dance Leeds and teaches almost every night of the week—lindy hop, Charleston, balboa and lots of private classes. In addition to running his own business, he continues to be heavily involved in running local non-profit organisations and events including Lindy Fridays, Lindy@ the Light, Future Sounds of Swing and Leeds Swing Exchange. Rob and Tina have been teaching and performing together for more than five years in Leeds and around the UK (and occasionally further afield). You may have caught a glimpse of them on tele recently on the hit series Peaky Blinders, dancing and smooching in the background. 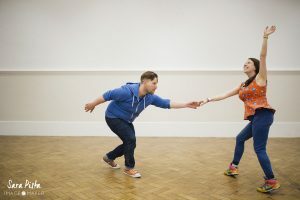 Rob and Tina’s classes often focus on core technique, lead-follow connection, and social dancing skills. They strive to give dancers a deeper understanding of the dance beyond just learning moves to help them develop their own style and have better dances with any partner. Another firm favourite at the festival, Trisha’s formidable energy, enthusiasm and encouragement will be directed towards our solo jazz dancers. Trisha hails from Hertfordshire, UK, and has been teaching since 1997 and on the international scene since 2003. For 10 years she contributed to establishing the first European swing dance brand and the biggest of its time. 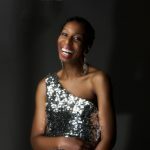 She is now thrilled to manage her own company SavoyHop.com (http://www.savoyhop.com/) creatively directed by her personal vision. Trisha has built up a reputation for being one of the most influential teachers within the European Swing Scene. She has spearheaded the revival of Authentic Jazz within the UK, working and training with some of the freshest dancers and teachers around. It’s been said that her teaching style is innovative, dynamic and inspiring. Always engaging and fun, Trisha loves to make people laugh and feel relaxed in her classes. At the end of her classes students are filled with energy and excitement. Trisha ensures that class material is detailed and balanced for followers. The result is the dance looks as authentic as it can. Trisha’s ability to communicate complex concepts and patterns clearly means students find themselves easily understanding how movements and steps should look and feel. Trisha has natural flair, a unique touch and very distinctive style on the dance floor. Her focus is to recreate the look of the original dancers of Lindy Hop, mixed with providing followers with drills, technique and musicality. An accomplished musician & experienced in Tap she helps others to understand rhythms and how to improvise within the dance. She has had formal training in Ballet, Contemporary, Jazz, Tap and musical theatre since the age 5. With 12 years’ experience in Swing dancing teaching most of the popular dances such as Lindy Hop, Authentic Jazz, Blues, 20’s Charleston. Trisha is serious about Swing and helps you get where you want to go! With a vast experience in choreography and artistic direction, she leads the way with her exciting approach to performance. Not only has she choreographed countless routines, she has also performed in the world famous Royal Albert Hall in London. Trisha loves to play and listen to early Jazz and swing music and has an extensive music collection; don’t miss out on inviting her to DJ! While travelling in America with his brother, Scott stumbled upon Swing dancing. He was instantly drawn to the energy of the dance, the music and the people. Scott made a New Year’s resolution to learn how to swing dance. Soon after, he began teaching classes and things took off from there. Along with his business partner Claudia, he started Swing Patrol, often called the world’s largest swing dancing school. Scott’s love for swing dancing was contagious—his classes grew from 23 people on the first night to over 200 people after eight weeks. Seventeen years later Swing Patrol run weekly classes in Melbourne, Sydney, Tasmania, Berlin and London. 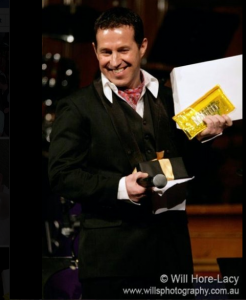 Scott moved to London in 2009 to open Swing Patrol London which now has over 900 students a week through its many venues and weekly social dances.